The past two months, many of our friends have diverted their contributions to aid victims of December’s tsunami. For the first time in a long while, KNOM is having trouble paying the bills. We cannot ask anyone to stop supporting the suffering people of Indonesia and Sri Lanka. KNOM staffers have personally donated to this effort. We do request that you consider sending our mission a little extra if you can, to help cover this shortfall right now. Thank you for your helping hand and your prayers. God bless you! FAR FROM HOME: (left) Kani Xulam (pronounced KAH-nee ZOO-lahm), at left, speaks with KNOM news director Paul Korchin, at right, with Bill Cox, MD in the middle. Xulam is the unofficial representative of the five million Kurdish people to the United States, spreading word of their plight. For 600 years, Kurdistan was a province of the Ottoman Empire. In 1923, European powers arbitrarily divided it among Iran, Iraq, Syria and Turkey, all of which have tried to destroy the Kurdish culture. Raised in Turkey, Xulam was not permitted to speak his native language, and was not allowed to be given a Kurdish name. Dr. Cox, a radiologist at Nome’s hospital, is interested in helping oppressed people around the world. When he learned that Xulam was traveling to Anchorage for a conference, he brought him on a 500-mile side trip to Nome. Rarely does KNOM focus so intently on matters occurring on the other side of the globe, but Xulam’s story was too compelling to pass up. INSPIRATIONAL SPOT: The creator of Mount Everest also made the comparatively miniscule people who climb it. We mustn’t be so awestruck by God’s power that we forget He’s also concerned about each and every one of us. HEY, BOSS! WE’RE READY! 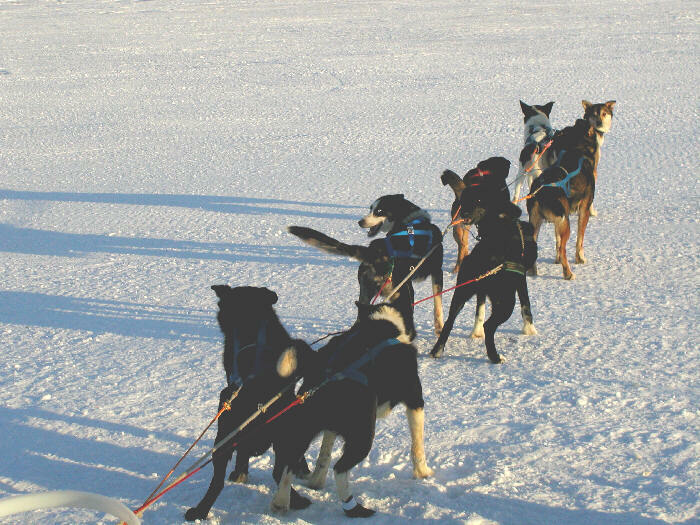 (Left) Nome musher Nils Hahn’s dog team is rarin’ to go at the starting line of a local two-day race in February. One of the leaders looks back intently, awaiting instructions, and the two dogs just behind impatiently jump forward and howl with excitement. Behind them, the dogs just can’t wait, and at the rear of the team, they’re already trying to pull. Once they got the signal, the team leaped onto the trail at speeds approaching 20 MPH. Nils won the race, making these enthusiastic dogs champs. Note the long shadows at high noon. TRIAL: The Matthew Owens murder trial continued at press time, occupying all of news director Paul Korchin’s time. KNOM became part of the story briefly, as general manager Tom Busch was called to the witness stand to testify as to when the station first announced the 2003 disappearance of young victim Sonya Ivanoff. MORE POWER TO YOU: In mid-February, KNOM ordered a new FM transmitter that will boost the station’s signal to 1,000 Watts locally in Nome. Only 88 Watts since signing on in 1993, the signal has proved to be a little weak in spots. KNOM-FM carries the same programming as our 25,000 Watt AM beams to the villages, but in more listenable high fidelity stereo to Nome. We expect shipment of the transmitter in mid-April. Please consider adding missions like KNOM to your will. We prayerfully place all bequests into funds for major capital improvements and to help the mission through unforeseen emergencies. 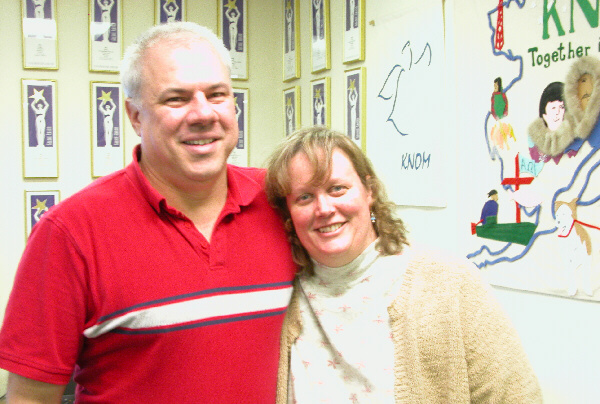 MOVING UP: In February, Ric Schmidt (left, with wife Lynette, who’s KNOM development specialist) became KNOM station manager. When general manager Tom Busch steps down, Ric will rise to that position. Meanwhile, Kelly Brabec has been promoted to program director, direct supervisor for everything over the air except news. ANOTHER MOVING STORY: Tom and Florence Busch had planned to move in February, but a snag in construction of their house in Anchorage has delayed things until mid-April. Tom’s looking forward to shedding KNOM’s top post to focus on strengthening the mission’s fundraising efforts. BOOK ‘EM! We’re uncovering more historic photographs, and now expect the “Highlights of KNOM History” book to go to press in late April. The main body of text is 240 pages, with 113 photos and 127 inspirational spots “so far.” The book will include a list of KNOM awards and a complete record of KNOM volunteers since 1966. We’re considering including a CD with some of our historic programming. What do you think? JUST PUT YOUR LIPS TOGETHER AND BLOW: It was fictional advice from Lauren Bacall to Humphrey Bogart in the movie “To Have and Have Not,” but on Saint Lawrence Island, whistling is serious business. Recently, KNOM public affairs director Amy Flaherty learned that the whistling one hears in the villages of Gambell and Savoonga is actually a form of Siberian Yupik, the language of the island. It’s a fact that’s little known except to the people who speak � or whistle � it. As Amy produced a “KNOM Profile” on the subject, she discovered that it was unheard of at the Alaska Native Heritage Center in Anchorage. The extremely remote island is much closer to the Russian mainland than it is to Nome, though villagers are devoted KNOM listeners. IRON DOG: It’s a 2,000-mile snowmobile race from Anchorage to Nome and back, and volunteer Clinton White spent dozens of hours coordinating KNOM’s coverage. Early in the event, ten-foot snowdrifts kept racers pinned down in the remote town of McGrath in central Alaska. THIRTY YEARS AGO: On the first day of spring, 1975, Nome endured a temperature of - 43�. This month, volunteer news director Steve Havilland was honored by Associated Press for his life-saving around-the-clock coverage of Nome’s flooding disaster the previous November. 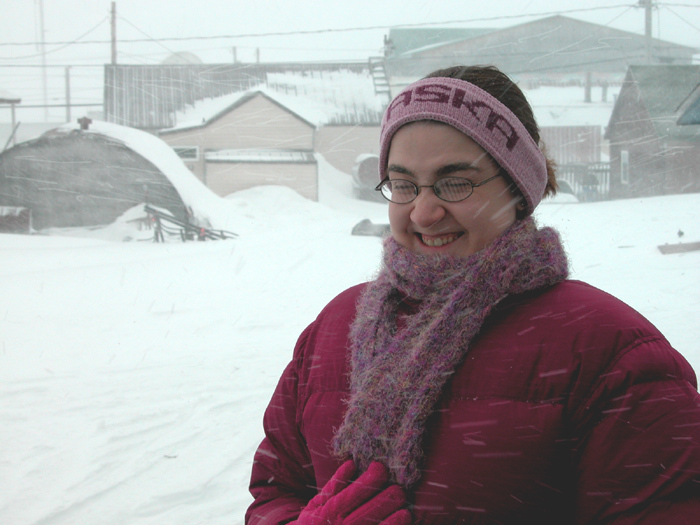 PASTED WHILE POSTED: (left) KNOM volunteer production director Liz Recchia has learned that a two-block walk to Nome’s post office can offer a snowy adventure. The wind was blowing about 35 MPH when this photo was taken. From Chesterton, Indiana, Liz is a 2004 graduate of Valparaiso University. She’s responsible for writing and producing KNOM’s educational spots. A GREAT RELIEF: In February, KNOM reported that traveling by snowmobile, a family of six was caught in a blizzard between the villages of Kotlik and Stebbins, 120 miles southeast of Nome. Often, these events have unhappy endings. In this case, though, the family did everything right. They stopped and turned over the sled they were towing to create the protection of a warm snow cave. Once the weather cleared, the dad and a son caught their bearings and walked to one of the villages. After two days, the other four were rescued � hungry and a bit cold, but otherwise all right. At the request of the people of Stebbins, KNOM broadcast a lengthy thank you to all searchers and rescuers. 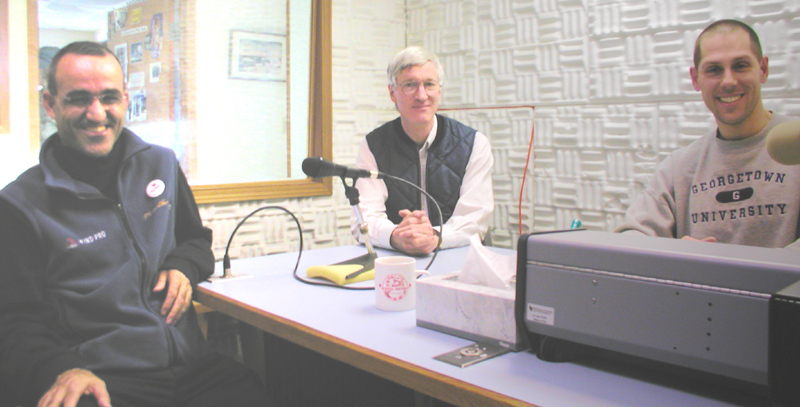 PRESIDENTIAL: As president of the Alaska Broadcasters Association, KNOM station manager Ric Schmidt logged 10,000 miles on airplanes, dispatched to lobby lawmakers in Juneau and Washington, DC, with ABA picking up the tab. Once again, thank you for your prayers and your financial help. Without both, our mission would quickly cease to exist. May Our Lord greatly bless you for your kindness.